A viral WhatsApp forward claiming a voter can cast their vote even if their name is on the electoral roll by asking for a ‘challenge vote’, is false. Two of the three claims in the forward are false. The second claim about asking for a ‘tender vote’ in the event someone has already cast your vote, is true. The viral message claims, “When you reach poling booth and find that your name is not in voter list, just show your Aadhar card or voter ID and ask for ” challenge vote” under section 49A and cast your vote.  If you find that someone has already cast your vote, then ask for “tender vote” and cast your vote. If any polling booth records more than 14% tender votes, repolling will be conducted in such poling booth. VCAN received an official reply from CEO Maharashtra responding to the viral message. According to the reply received by VCAN, a voter cannot vote unless his / her name appears on the electoral rolls. 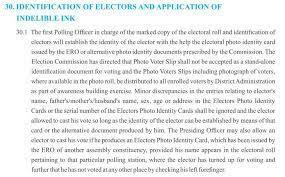 Additionally, BOOM read through the handbook issued by the ECI for polling agents that in February 2019 that states the polling officer would primarily identify the voter through the electoral roll. CLAIM 2: If you find that someone has already cast your vote, then ask for “tender vote” and cast your vote. “If you find someone has already cast your vote, then ask for ‘tender vote’ and cast your vote,” stated the reply by CEO Maharashtra to VCAN. 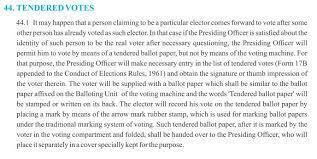 In the handbook also mentions that if a voter finds out that another person claiming to be that elector has voted in his / her name then the Presiding officer will permit the person to vote by means of ballot paper. “There is no legal provision regarding repoll in case of challenge vote. In no case, there are unusual percent tender votes. Even if there are, there is no provision for a repoll,” according to CEO Maharashtra. BOOM did not find any mention of the above claim in the EC handbook.